The 20th century was the century in which the wristwatch was born(*), but it looks like the 21st century may be the century in which the wristwatch dies. 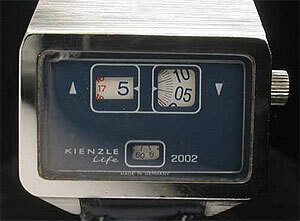 According to a survey by watchmaker Seiko, only 46% of people wear wristwatches today, down from 70% only a decade ago. They say the drop is because of more and more people using the clocks on their cellphones as their primary personal timekeeper. That makes sense I guess, but I'll miss the wild and wonderful variation in wristwatch design. Want to see what I mean? Take a look at The Watchismo Times. (*) Actually, the first commercial wristwatches hit the market just before the end of the 19th century, but wristwatches really took off a decade later during World War I. Thanks for stating this. I realized myself that since I own a mobilephone, I more and more leave my wristwatch at home, eventhough it is a really nice model and not the big thing some people wear on their hands. Friends of mine and the people I meat also have their collections of watches at home, however, nobody wears them except -- and I think this is the "new life" of wristwatches -- as something like jewelry for man.